Alappuzha (Alleppey) is considered to be one of the best tourist places in India. It is also called as 'the Venice of the East'. 'The Nehru Trophy boat race', 'the Boat Cruize' and Pathiramanal are some of the attractions here. Alappuzha District, formerly called as Alleppey was established in 17th-August-1957 and is considered to be one of the best tourist areas all around India. 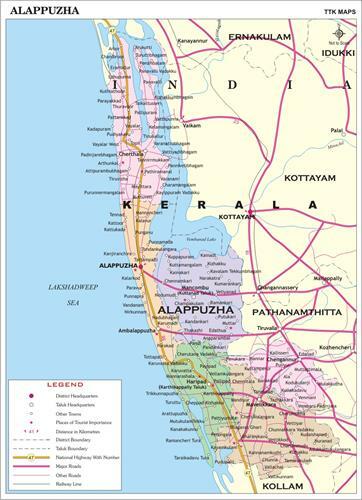 Kottayam and Pathanamthitta cover its eastern part, Arabian Sea to its west, Ernakulum to its Northern region and Kollam district to its South. 'Lord Curzon' refers this district as "The Venice of the East" as this place is blessed with attractive beaches, backwaters, sceneries, canals, etc. Alappuzha got its name from the two words 'Aal' and 'Puzha' which means 'sea' and 'river'. This was the oldest town formed by and is famous for its coir factories all over the place. According to 2011 census its population is 2,121,943 of which 1,010,252 are males and 1,111,691 are females in which 1,147,027 are urban people and 974,916 are living in rural areas. Thus there exist 1100 females per 1000 males. It covers a total of 1414sq.km of land with tropical climatic conditions. The district receives an annual rainfall of 299cm having an altitude of 5m above the sea level. Malayalam, Hindi, English and Tamil are the languages spoken here. Alappuzha has the highest population density of 1,501 d/sq.km among other districts and its population growth is 0.61%. About 96.26% of the total population is literate. 'Snake boat race' and 'Nehru Trophy boat race' are the traditional events held here. The Kuttanad paddy field commonly called as 'Rice bowl of Kerala' is famous for the profitable outcome that it makes every year. There is a lighthouse along the costal side of this town which is considered to be the oldest one of this district. The house boating cruise takes more attraction of tourists. This may be the smallest district of Kerala but it is the most beautiful site for tourism. Alappuzha was a small town founded out in 1762 by a Divan named 'Raja Keshawadasan' of Travancore and was established in 17th-August-1957. The district was called as 'Alleppey' during British reign but by 1990 the Kerala Government decided to call it 'Alappuzha' which will suit the culture of the land. From past onwards Kuttanad had great demand and was a perfect recreation site. An Anglican Church was built up here in 1851 and society of the Missionary Church had set up its local headquarters here. Thiruvalla, Mavelikkara and Chengannoor later became a part of Pathanamthitta district from here. Alappuzha was the first to have a post office in Travancore. There was a time when Alappuzha was called as 'the Venice of the East' with great trade of coir products and fast running factories but is now a dying town. Alappuzha was a district that had played a great role in the struggle for freedom. An inspiring journalist named T.K. Madhavan struggled hard to whip out untouchability from the district by conducting campaign and had also provided roadways for the Hindus to their temple. In 1938, Kerala faced the first political strike here with great inspirational movements made by the leaders. Krishna Puram Palace located 47km from Alleppey on the way to Kollam district, is an ancient palace which was built by 'Anizham Thirunal Marthanda Varma' in 18th Century with lot of hard works done by his fellow workers. The palace got its name from 'Krishnaswamy Temple' which worships the Lord Sri Krishna. It can be considered both as a museum and a palace as it has large stylish paintings and all sorts of historical equipments. The main attraction is the 'Kayamkulam Sword' which was used by soldiers for fight. The way of its construction is quite unique with a large pond in its premises which has a secrete passage for the safety of people from their enemy. It was built by many skilled workers who gave a Kerala touch for it. The Archeological department of Kerala still strives hard to maintain this monument and is now the major attraction in this district. 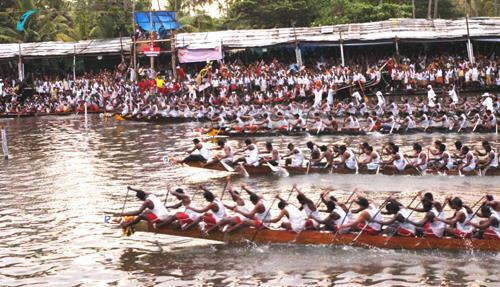 Nehru Trophy Boat Race is an annual event held every year during August or September on the Punnamada Lake. It was started when Pandit Jawaharlal Nehru 1st visited Alleppey district in 1952 and enjoyed a boat race from Kottayam to Allapuzha. After a neck to neck fight Nedumbagam team stood first place. This made Nehru thrilled and his unconscious mind drove him into the Chundan Vallam and took him to the shore without any protection. He enjoyed all its moment as if he was also a part of the team. Later he decides to donate a trophy which was later called as the Nehru Trophy that had the shape similar to a Chundan Vallam. Many snake boats representing different villages take part in this race. This is one of the top attractions for the tourists who visits Alapuzha district. Ambalapuzha which was the capital of Chembakashery, is a small town which is situated 16 km from Alapuzha on the way to Kollam district. 'Ambalapuzha North' and 'Ambalapuzha South' are its two major panchayaths. This town is famous for the Sri Krishna Temple (worships Lord Sri Krishna) which was built by the Chembakashery ruler named 'Pooradam Thirunal'. The 'Ambalapuzha Payasam' is another famous sweet recipe made of rice, sugar and milk which has high demand. It is believed that the famous art named "Ottamthullal" was first discovered and practiced by 'Kunchen Nambiar' and a memorial is established nearby for his remembrance. This is quite an interesting place and visitors will get a historic feeling with unleashed memories. This is a small village situated 3km east of Alleppey near Ambalapuzha. It is famous for the 'Karumadi Kutten' which is a statue of Buddha made of black coloured granite. The statue got its name from its place Karumadi. It is believed to be carved during the 9th or 10th century and catches attraction of many people even now. But its appearance with right half broken makes it a rare one and historians discovered that it was an attack from an elephant giving a special appearance. It is due to this idol more and more travelers and archeologists visit Karumadi every year. Dalai Lama had worshiped here during his trip in 1965. Tourists are craving to come across and experience the life Buddha. It is a small beautiful island in the Vembanad Lake about 1.5 km far from Muhamma boat jetty. Pathiramanal has a meaning of 'Sands of Night' and is the most wonderful place for site seeing with large numbers of migratory birds which come here for all bird lovers. More than 100 species of birds live here like Night Heron, Indian Shag, Common Teal, gull, egrets, Cotton Pygmy Goose, Jacanas, Stork billed Kingfisher, and many other rare ones too. Tourists can visit here by enjoying a long fascinating trip in speed boats and can enjoy the beauties of nature. Marari Beach Resort, Marari Beach homes, Alleppey Beach Resort, Pagoda Resort, Lake Palace Backwater Resort are some of the places suitable for home stay. This is an island which has a great historical background. Rather than these there are lots of other places for the tourists like Arthunkal, Mullackal Raja Rajeswari Temple, Punnappra, Sherthala, Chengannoor, Mavelikara, Mannar Sala Sri Nagaraja Temple, Kayamkulam and lots more. The visitors will feel like a paradise when they enjoy their holiday trips here in Alleppey.